Torbjörn Blom´s Projects: New week new challanges! My new plan is to write on English because you newer know when some one from outside Sweden whants to read this also it is a good exercise for me. So it is a new week again. Feels good that it is filled to the edge of explosion. We are going to the arcitectec again and hope that he likes our changes that we made on the drawings. I will come back on this subject later. nd casual gamers and the luck factor with the dice is very fun and agreevaiting. 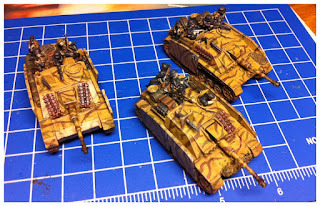 Yesterday did also managed to finish my StuG G + Beigleit teams. I am very pleased with the outcome of this. 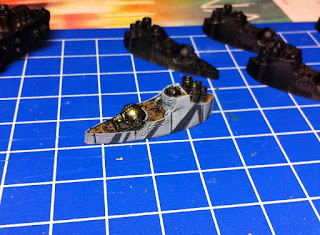 After finishing the StuG did I start on my new project for Dystopian wars. I will run a Confederation of Antartica fleet. 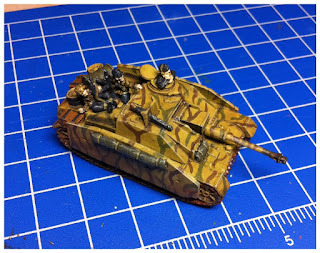 I have made the first try out model that I am pleased with. Until next time, keep the waters calm.